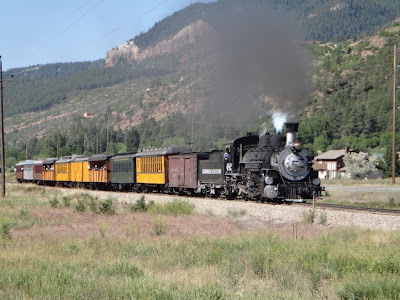 Photograph 1 - The Durango-Silverton Tourist train passing through the village called Trimble, Colorado. Photograph 2 - Harry the chip bag is back - expanded out at 11,000 feet above sea level, near Silverton, Colorado. 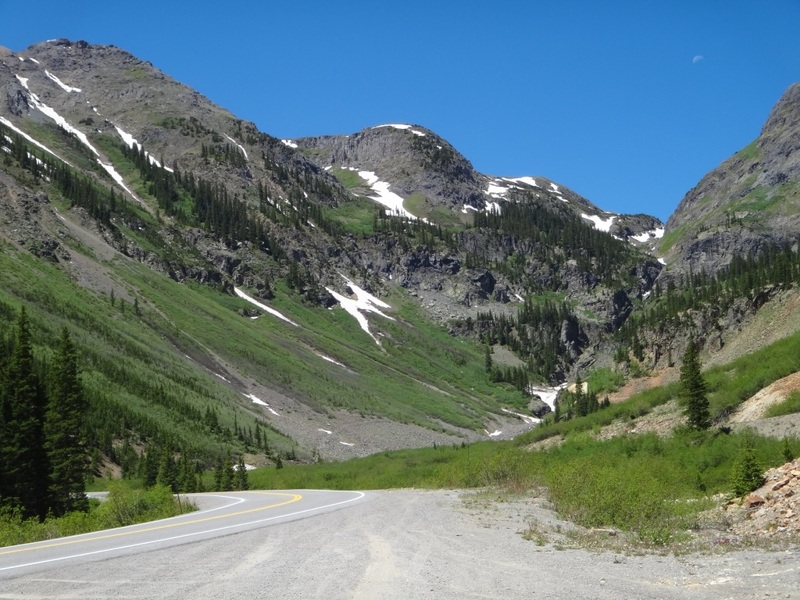 Photograph 3 - View of the road and high mountains near Silverton, Colorado. 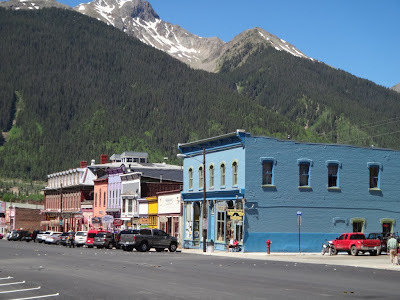 Photograph 4 - The main street of Silverton, Colorado - a cowboy town that still retain its old charm. 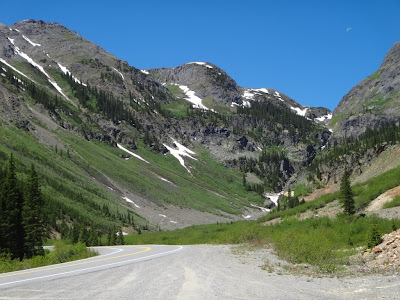 Photograph 5 - The scenic drive between Silverton and Ouray, Colorado. 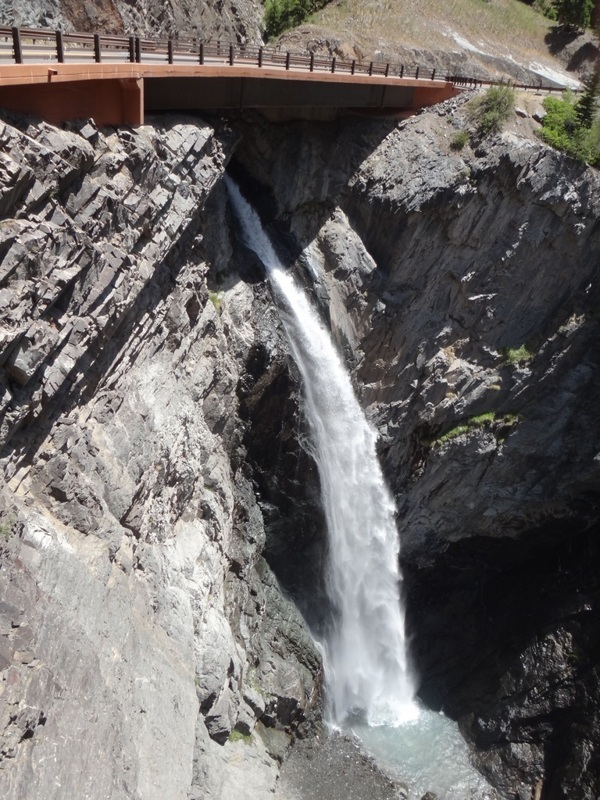 Photograph 6 - A scenic waterfall on the outskirts of Ouray, Colorado. 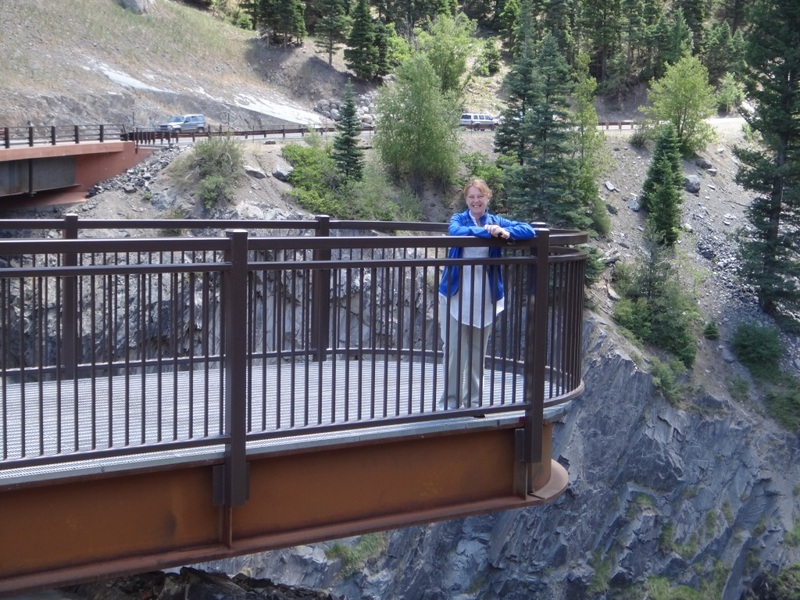 Photograph 7 - Same place as photograph 6 - with a "skywalk" viewing platform. Photograph 8 - The picturesque town of Ouray, Colorado. 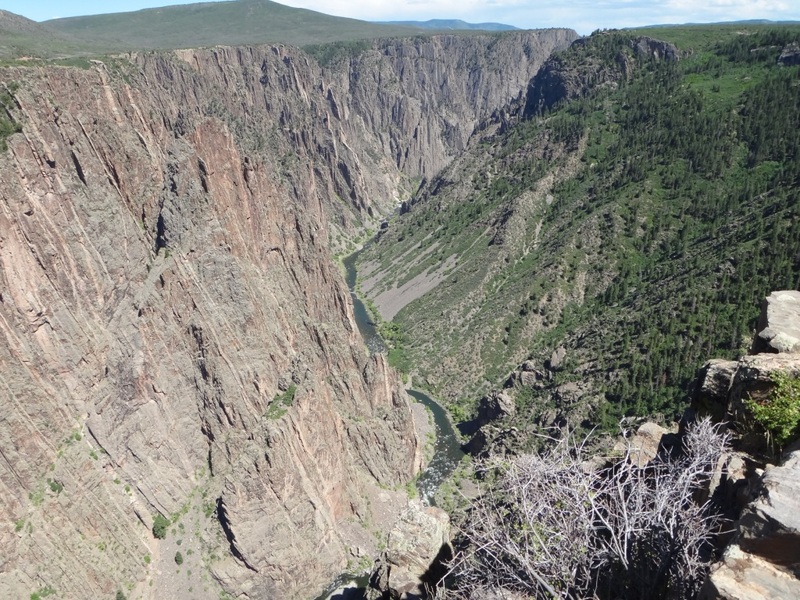 Photograph 9 - One of the viewing sites overlooking the deep Black Canyon near Montrose, Colorado. Photograph 10 - The Painted Wall at the Black Canyon National Park, Colorado. We had a little accident this yesterday. Some liquid laundry soap leaked into Anne's bag so this morning we found a laundrymat and washed clothes that had been affected. 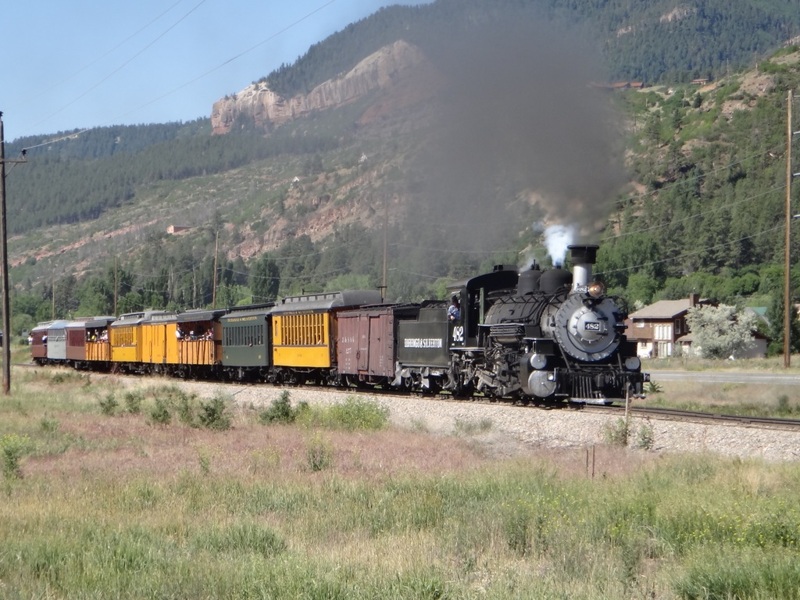 After spending about 45 mins and at 8:45am we left Durango and followed the Silverton tourist train through a place called Trimble! Onwards we ascended high into the Rockies to Silverton. This is a town that has not been modernised and still retains its Victorian era charm. 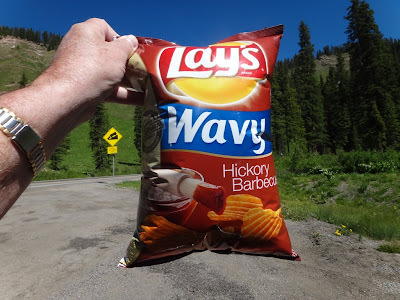 We did ascend above 11,000 feet (not as high as 16,200 feet we experienced in Peru) but a certain chip bag decided to double its size. It was errant of us if we had to open "Harry" then but will wait until we go back to near sea level. We wandered the main street of Silverton for an hour and then continued through one of America's famed scenic drive. 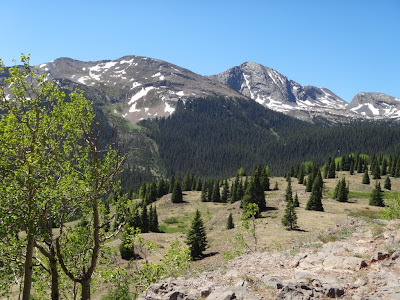 It was 23 miles between Silverton and Ouray and what a great drive. Hair-pin bends, waterfalls, snow-capped mountains, conifers and black bears (no we didn't see any). 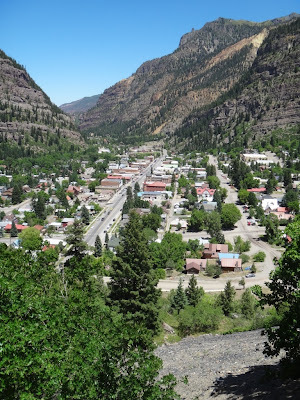 We had lunch at Ouray and continued on to Montrose and the Black Canyon National Park. 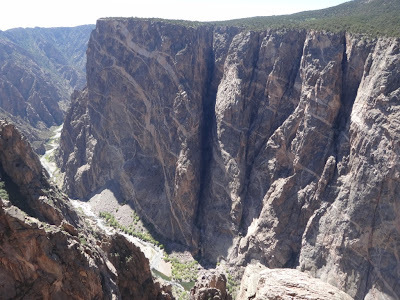 It was a $15USD vehicle entry and we thought that was a rip-off......however, the deep canyons and unusual geological features changed our minds. The deepness of the canyon are higher than two Empire State Buildings......so they say. The experience was overwhelming and we were glad we visited this side of Colorado. 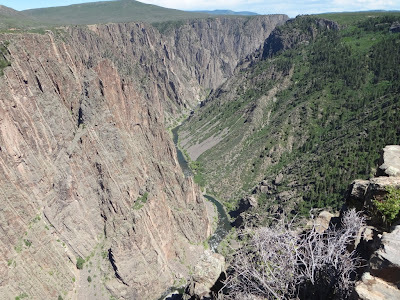 We arrived at our overnight stay at Gunnison and had dinner at a joint called Gunniesack. We had the best hamburgers. They even ask if you want your burger rare, medium or well-done! Apparently the owner told us back in the late 1940's when John Wayne and John Ford were shooting some movies scenes had come to this bar and restaurant, got drunk and made the place famous. Tomorrow we will be well into the Rockies with a destination near Denver, Colorado, staying at a skiing resort called Winter Park. We are staying there for three nights - a bit of a break of driving and just relaxing. See yah and cheers.